The tradition of the intensive practice period dates back to the time of the Buddha when, during the rainy season, the Buddha and his disciples gathered in one place to meditate and study together. As our own rainy season approaches here in the Pacific Northwest, we will hold our 15th annual Mountain Rain practice period. In Zen monasteries intensive practice periods traditionally last for three months, but ours is shorter, designed to support participants to intensify and strengthen their practice while living in the midst of family and work responsibilities. This year's practice period will be led by resident teacher Myoshin Kate McCandless. She will lead the opening weekend retreat and a Wednesday evening dharma study series. Practice period culminates in our annual Loon Lake six-day residential sesshin led by Zoketsu Norman Fischer, which follows the ancient rhythms of the monastic daily schedule, including meals with oryoki, the traditional three bowls used by monks. During practice period, the shuso or "head monk" is a long-time practitioner whose role is to support the sangha by offering a weekly class, giving several talks, meeting for tea with participants, and cleaning washrooms, a traditional practice of humility. This year, we’re happy to welcome Kanshin Ruth Ozeki as shuso. Ruth received lay ordination (jukai) in 2005 and priest ordination in 2010 from Zoketsu Norman Fischer. Ruth is an acclaimed novelist, whose third novel, A Tale for the Time Being (2013), is deeply informed by teachings from Dogen on the nature of time and being. There are no specific requirements but we encourage you to clarify your intentions in advance. To that end, a form is provided below for you to print out (or open in a word processor) and annotate. To help us anticipate how many participants we will have, and support your practice well, we’d appreciate it if you could send a copy of your filled-out Practice Period Guide to info@mountainrainzen.org. This would be shared only with the resident teachers, shuso, and your practice mentor, if you choose to have one. Please take into consideration your family and work commitments and decide what will best nourish your practice. Practice period is a wonderful way to strengthen and nourish your practice, supported by the sangha. We hope you’ll be able to participate in whatever way is best for you. Our practice period mentors this year will be Ninen Susan Elbe, Joko Claire Talbot and Dai-i Flo Rublee, long-time practitioners who have served as shuso for a previous practice period. We recommend that you schedule a time to meet with your mentor in person, by phone, or by email at the beginning, midpoint and end of the practice period. At your first meeting we suggest going over your intentions for the practice period and identifying any particular areas or themes you'd like to focus on. Please email info@mountainrainzen.org if you would like a mentor, and we’ll put you in touch. For those who cannot come to the zendo regularly, or live at a distance, dharma talks will be made available on the website soon after they have been given. Dokusan (individual meeting) with resident teachers Shinmon Michael and Myoshin Kate is available by phone and you may also meet with practice mentors and the shuso by phone or e-mail. Please email info@mountainrainzen.org if you would like to participate remotely. Two zazen periods followed by shuso entering ceremony. Practice period opening retreat led by Myoshin Kate McCandless. A dharma study series with Myoshin Kate McCandless. A dharma study series with shuso Kanshin Ruth Ozeki. With dharma talk by Kanshin Ruth Ozeki. A light lunch will be served. 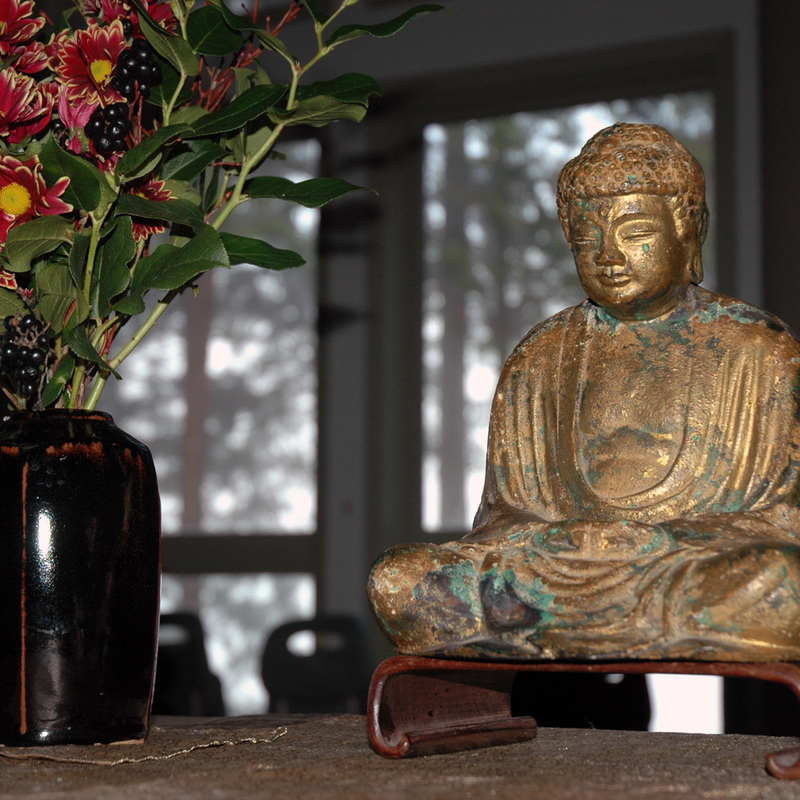 Residential Zen retreat at Loon Lake Camp, Maple Ridge, BC, concluding with shuso's Dharma Inquiry Ceremony. Two periods of zazen and closing ceremony, after which we will take the shuso to lunch.